After lots of rumors and leaks about the Nokia 2 we now finally get to see the real device. HMD Global has officially launched the Nokia 2 smartphone at the launch event held in India. 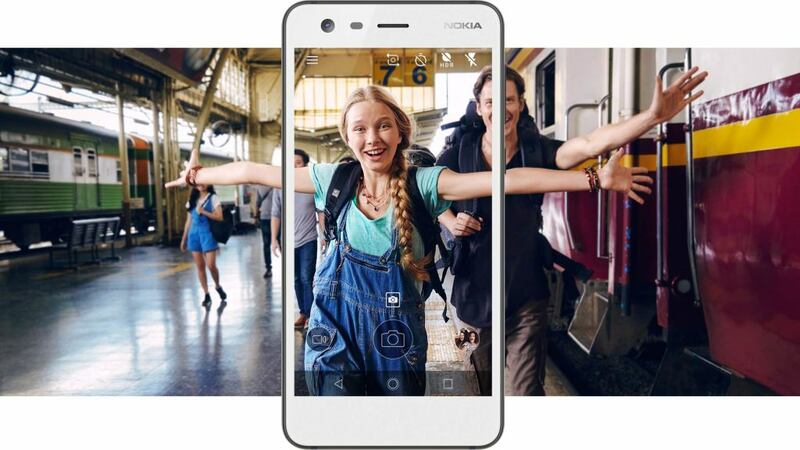 Nokia 2 is the youngest member of the Nokia smartphone family and is targetted at the low-end smartphone market. Nokia 2 is a low-end smartphone running on stock Android Nougat with a promised update to Android Oreo. The phone is powered by an SD212 Processor coupled with 1GB of RAM and 8GB of internal storage that can be further expanded up to 128GB. Nokia 2 comes with a 5" 720p LTPS display which is bright and also consumes less power. Nokia 2 comes with an 8MP autofocus rear camera with LED Flash and a 5MP Fixed focus camera at front. The main highlighting feature of Nokia 2 is its 4100mAh big battery which according to HMD Global should last for around 2 days. Nokia 2 is a low-end phone without any compromise on the build quality. Nokia 2 comes with a sturdy metal frame made out of a single block of 6000 series aluminium and the back has a sturdy polycarbonate shell under which you will find dual sim card slots and a dedicated microSD card slot. The entire front is protected by Gorilla Glass which is rarely seen on phones at this price range. The phone comes with IP52 Dust and water resistance which is another rare feature in this price segment. New Delhi, India, 31 October 2017 – HMD Global, the home of Nokia phones, today announced the launch of the Nokia 2. Nokia phones are associated with great battery life; today, we announce a smartphone that takes it to a whole new level. 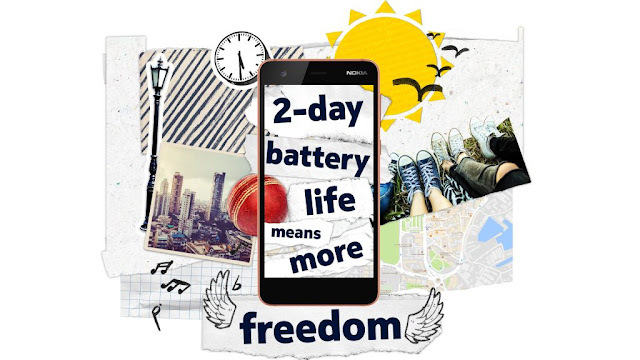 With two-day battery lifei, the Nokia 2 is built to keep going long after other smartphones need recharging. Its impressive two-day battery lifei doesn’t come at the expense of performance. Combining a Qualcomm® Snapdragon™ Mobile Platform and a 5 inch, high quality display with the pure, secure and up to date AndroidTM experience, the Nokia 2 offers technology that you can depend on, all day every day. “People rely on their phones so much these days with many people subconsciously rationing their battery life when out and about so they can last the day. We don’t think you should have to do less with your phone which is why we created a smartphone that can power through when other devices need a pit stop. The Nokia 2 delivers unrivalled durability in design, drawing on all the hallmarks of the Nokia phone heritage of quality, simplicity and reliability. Its sleek frame is precision-machined from a single block of aluminium while Corning® Gorilla® Glass is complemented by sculpted polycarbonate on the back delivering both a great feel and the build quality you expect from a Nokia smartphone. Premium materials and thoughtful, ergonomic design combine to create a unique model that's as practical as it is stylish, leaving you free to enjoy an affordable, long-lasting smartphone experience. With an 8MP rear camera featuring automatic scene detection and autofocus, the Nokia 2 ensures you get fantastic shots every time. Using the 5MP front camera, you can capture the moment from any angle. You will always have the extra capacity you need for the memories you capture with its dedicated memory card slot and unlimited photo and video uploads to Google Photos. 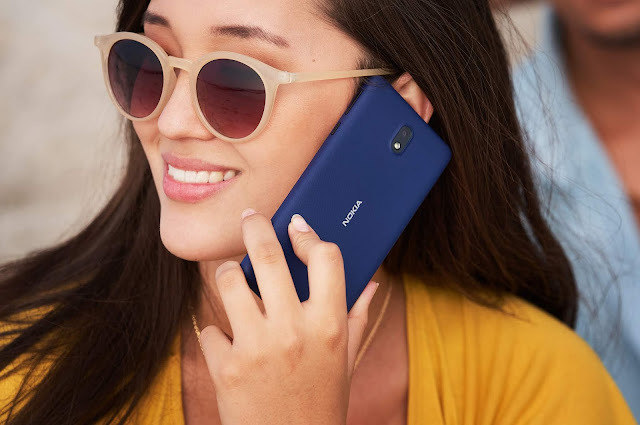 Nokia smartphones always offer a pure, secure and up-to-date Android experience, with incredible features like Google Assistant but no preinstalls or skins. Launching with Android Nougat and Android Oreo ready, the Nokia 2 receives monthly security updates so you can be sure that your smartphone is safe and up-to-date. The Nokia 2 will be available in Pewter/Black, Pewter/White and Copper/Black for a global average retail price of €99.